An allegorical story of a beggar’s perplexing dreams offers a compelling and original perspective on the Five Pillars of Islam. The performance features music by Brian Baumbusch, director of the Bay Area’s trailblazing Lightbulb Ensemble, and a libretto by Paul Baumbusch. Playing on Balinese gamelan Semar pegulingan, the members of Lightbulb are joined by organist Brett Carson, guitarist Ramon Fermin, narrator Christina Stanley, and South African video artist Chris Bisset. In Hamsa,the gamelan becomes a vessel for realizing musical symmetries built on interlocking fragments woven together in a tessellation, and fractal-like colotomic structures inspired by Islamic geometry and tile-work mosaics. The concert-length piece follows a storied narrative based around the Five Pillars of Islam in which each movement meditates on the moral principle embodied in each pillar, becoming a narrative coloring, in which musical renditions are designed like tile-work tessellations and shape-shifting kaleidoscopes. The music draws inspiration from various sources including Balinese music, early-minimalism of the 1960s, progressive rock, and many others. The Lightbulb Ensemble (LBE) is a new music percussion ensemble that champions experimental music, instrument building, and contemporary gamelan. The ensemble emerged from the culture of new music at Mills College and the longstanding artistic exchange between Indonesia and the US that permeates the Bay Area. 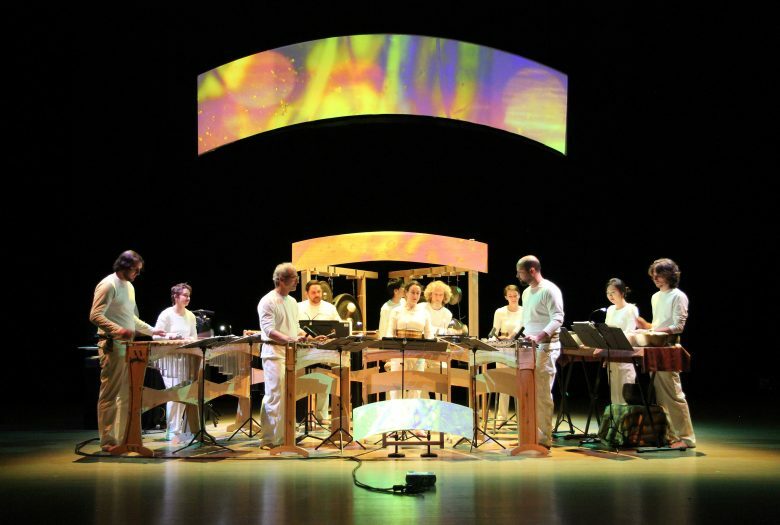 LBE performs on steel metallophones, wooden marimbas, and other instruments designed, tuned, and built by Brian Baumbusch, LBE founder and director. Performing only new repertoire, the group presents in-house compositions and collaborates with other artists of the new music community, including the Paul Dresher Ensemble, the JACK Quartet, Jessika Kenney and Eyvind Kang, and The Center for Contemporary Music, among others. Christina Stanley is a violinist,vocalist and composer who began piano at 5 and violin studies at the age of 8. She began voice studies with Carolyn Bisel at 15 and attended the San Francisco Conservatory of Music from ages 15-18 where she studied violin with Li Lin and eventually earned a full performance scholarship to San Francisco State University. There she earned her Bachelors of Music and studied violin with Daniel Kobialka, Jassen Toderov and the Alexander String Quartet, and voice with Alissa Deeter. After touring Europe and the US with various music groups, she attended HB studio in New York City where she studied theatre, dance and voice for two years. She then went on to earn an MFA in Music Performance and Literature from Mills College, where she studied violin with David Abel, composition and improvisation with Fred Frith and Roscoe Mitchell. She is currently an active performing musician working as a solo artist and as a member of various groups. She has performed and recorded as a member of SF Sound and ROVA Quartet. She has been a featured Solo performer for the San Francisco Electronic Music Festival, a vocalist for the William Winant percussion ensemble, and has premiered works by George Lewis and Roscoe Mitchell for Mutable Music under conductor Petr Kotik. Paul Baumbusch is an award-winning playwright, prolific poet, and operatist. During his year as a creative writing major at Interlochen Arts Academy, he won the 2004 VSA Playwright Discovery Award, the prize of which comprised a scholarship and two performances of his piece, The Changeling, at the Kennedy Center. At Northwestern University, he earned a Bachelor of Arts in English Literature. A lifelong love of classical music led Baumbusch, a self-taught composer, to create the opera Pavio. Pavio is a Neo-Baroque work that features a gay protagonist. It is currently being arranged for orchestra. Baumbusch’s artistic influences include Emily Dickinson, George Frideric Handel, and the film directors Carl Theodor Dreyer and Luis Buñuel. Above all, his art strives for timeless beauty. “Hamsa” is made possible by the generous support of the Smithsonian Institution.